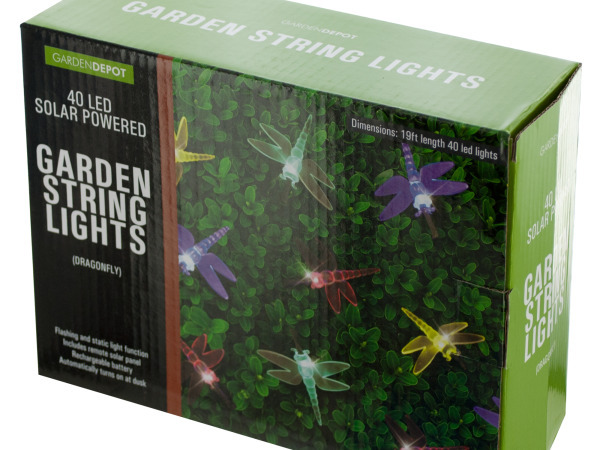 Make your garden glow with this Dragonfly Solar Powered LED String Lights Set featuring 40 transparent dragonfly lights with bright LED bulbs, a solar panel and a rechargeable battery. Lights charge during the day to light up at night. Up to 8 hours run time. Easy to use, no wiring required. String measures approximately 19' long. Comes packaged in an individual box. Box measures approximately 8" x 3" x 6".